I like red wine.. But does my face feel the same? I think companies put practically anything in facial masks nowadays.. Well, I'm not complaining if they can deliver results! This mask smells delightfully of berries... Fresh juicy berries. Yum! Actually kinda similar to the Mixed Berries one, I think? It functions as an antioxidant and for blood circulation. I already don't expect to see these two results but I just like a nice smelling hydrating mask. Because you girls probably miss me so much.. Here's my stupid mask face =/ Good fit as usual.. 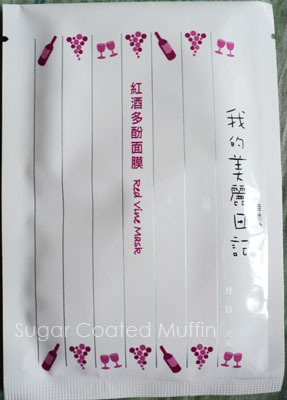 Still deem this to be the most comfortable facial mask ever ^_^ Doesn't slide off or dry out before the time's up. My conclusion : Since this mask was not intended for brightening or whitening, there were no such effects but it's hydrating. It's not at the top of my repurchase list but because of the smell, I wouldn't mind repurchasing it!